Since my first Star Wars marathon in college, I wanted to walk out the church at my wedding to the Throne Room March at the end of Episode IV. Han, Leia, pomp and circumstance, happily ever after – it seemed perfect. To be perfectly honest, I was not even a HUGE Star Wars fan at the time. Then years later, I met hubby, and he was (a huge fan), so of course he happily agreed! We even took it a little further: Our guests walked out to the Imperial March. And then a little further still: We entered the reception hall, under an arch of lightsabers (held up by our wedding party) and bubbles – to the Star Wars theme of course! …and as a last minute surprise to the hubby, I decided on a Star Wars cake topper (pictured above). $15 in figures + $70 in overnight shipping charges + friend Amy’s skill with foamcore, X-acto knife, glue and wooden chopsticks = Awesomeness! Many hopes and wishes that you have friends and family to share your passions with. The photos were taken by Orris Photography. 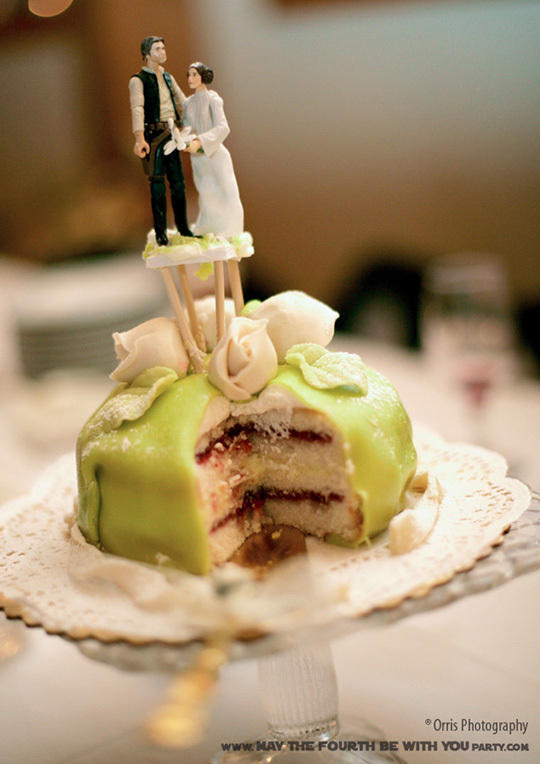 The fabulous Swedish mini princess cakes with green and white marzipan, vanilla sauce, whip cream and raspberry jam were made by Bakeshop Wedding Cakes.